Swirly Bird “pinwheels”. Isn’t this cute using only one stamp for the pinwheels. Easy to line up because of the photopolymer stamps in this set. This set is very versatile and has been the most popular set in the new catalog (from what I have seen). The colors used for the pinwheels are Flirty Flamingo and Melon Mambo; Peakaboo Peach and Tangerine Tango; Dapper Denim and Tempting Turquoise; and Emerald Envy and Wild Wasabi. Four of the colors are the new In-colors (the first colors listed for each “set”). This was CASE’d from Jenny Hayward and these are the colors she came up with. I used different “dots” for the centers-all from the Regal Collection. I also used different backround paper: Dapper Denim and Peakaboo Peach (both new In-Colors). This is a fun card to make. If you would like to order the set which comes with 24! stamps, see my 24/7 online store at http://darleneseitz.stampinup.net. Here are some more cards from the new 2016-17 annual catalog from Stampin Up. The first two are quick and easy cards using the new hostess set Love you Lots. The third cards also uses a hostess set called Gift of Love. Both are available to you when you host a qualifying party. Book your party today so you can receive access to these sets. Here are three cards that show some of the new in-colors from Stampin Up. Here is peek a boo peach, sweet sugar plum, and flirty flamingo. The other two in-colors are emerald envy and dapper denim. The colors come in a full line of products, ink, markers, paper-card stock and Designer Series Paper, washi tape, ribbon and embellishments. This makes it easy to create a coordinated card or scrapbook page. Both these cards are also made with stamp sets and thinlits that are in the new catalog. Swirly bird stamp set and thinlits (and if you bundle them you save 10%) and Sprinkles of Life stamp set which comes with a coordinating punch. 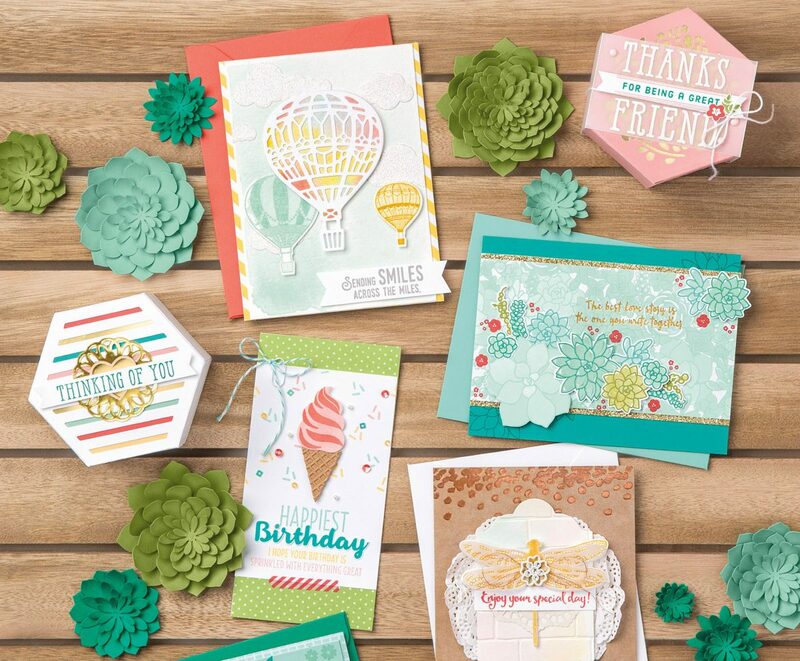 See my store at darleneseitz.stampinup.net for all the catalog products. See blog post for yesterday for all the details. Deal starts today June 9 through June 10 at 11:50 p.m. Don’t miss out.What is Paper Pumpkin? It’s a complete craft kit that comes out monthly. It includes stamps, ink, all paper good and embellishments, and adhesive. Stampin Up is running a deal for 31 hours only, on a month to month basis the June kit for only $5.00!! Now is the time to try Paper Pumpkin. It’s such a nice treat to get in the mail each month. It lets you be creative without the hassle of buying all the supplies yourself. Everyone needs a creative outlet and Stampin Up makes it so easy to do. There are step by step instructions and a youtube video giving instructions. Also, I would be more than willing to help you in any way once you receive your kit. It starts Thursday mid-day and runs till about midnight Friday. Tomorrow I will post the exact times. This is one deal you don’t want to miss. To order tomorrow go to paperpumpkin.com and use demostrator code 2096764.